The markets are almost by definition, anxiety-inducing. Pursuing a practice that helps put things into some better perspective should be a good thing. However if you approach mindfulness and meditation as just a means for greater business and/or investing success you will likely be disappointed. Mindfulness is about putting your mind in a healthier, more balanced state, and that is a recipe for living a richer, less anxious life. What is the #1 fear most people have about their finances? What’s the fix? They worry about not having enough money to cover an emergency, their lifetime healthcare, a job loss or extended unemployment, or the death of the primary breadwinner. But, most importantly, almost everyone worries about not having enough to create an income stream in retirement that they cannot outlive. You need to use your surplus earnings wisely by establishing an emergency fund, avoiding high interest debt, and investing mindfully. Once you’ve taken these steps, it comes down to adopting a few core beliefs. You need to have Faith in the future, Patience to wait for the future to come to fruition, and the Discipline to work your plan while you wait. What is a happiness dividend? Aristotle viewed “Happiness” as the central purpose of human existence and life’s most important goal. When I talk about earning your Happiness Dividend, I am actually talking about realizing your ultimate purpose as a human being. In finance, a “dividend” is a share of profits that are distributed to owners of a company. But “dividend” has a more general meaning as well: a return or reward that results from your efforts. Our relentless obsession with money and investing is ruining our happiness and causing bad financial outcomes. We react impulsively to emotional financial triggers instead of responding mindfully. By DOING less, we can actually get further ahead. For this strategy to work, you must first figure out what you truly want from life and let that be the guiding light of all your financial behavior. Then you need to follow the simple financial steps I outline in the book – such as paying off high-interest credit card debt and investing for retirement. Mindfully follow these steps, and you’ll become more financially secure and happier. That’s what I mean by earning your Happiness Dividend. To use a rather broad brush, I define mindfulness as a non-judgmental awareness of what is really going on for us in the present moment, both in terms of our five sensory inputs and our mental and emotional interpretation of those inputs. Mindfulness doesn’t come naturally to most folks, including me. That’s why I’m a huge advocate of meditation and mindfulness training. Many people I’ve talked to over the years will say something like, “I can’t possibly meditate, because I can’t sit still for that long.” But that’s the whole point of meditating. If you can’t sit still, I think it’s important to understand why that is the case. We humans are hard-wired to feel like we constantly need to be doing something. At the same time, our brains don’t ever shut-up. While we’re busy doing whatever that something is, our brains continue secreting thoughts into our consciousness. So, once we’re done with that activity, both we and our brains are off to “doing something” else. The brain keeps bringing stuff into our focus, but much of it isn’t all that helpful or important. Unless we take the time to understand this process, we just blindly follow along. Mindfulness training helps us navigate through this endless stream of thought secretions, so that we can deliberately choose which ones (if any) deserve our attention. 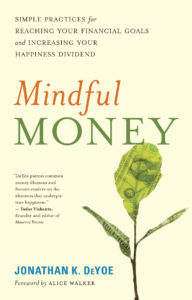 How can the practice of mindfulness be applied to personal finance or money management? Personal finance is way more personal than it is financial. When we flip this equation and start following talking heads in the financial media who “know” more than we do, instead of listening carefully to our personal inner voice, we lose our way. Philosophers throughout the ages have wrestled to explain how we know what we know. The sheer enormity of this question should cause us all to pause before we accept the veracity of anyone claiming to possess knowledge of any kind – especially knowledge of something as big and variable as the global economy. We must also accept the limits of our own knowledge. Since each of us has a subjective understanding of the world gleaned from our 5 or 6 (in Eastern traditions) senses, what we consider knowledge is actually a social agreement about how we interpret and communicate about the world around us. Unfortunately, accepting this social agreement in our financial lives means trying to spend our way to happiness and participating in the blowing up and popping of every stock market bubble that comes along. This combo creates incredible anxiety and bad financial outcomes. Mindfulness helps us avoid these pitfalls, stick to our long-term financial plan in the face of short-term temptation, follow our investment discipline no matter what the market is doing, make the tradeoffs necessary to reach our goals, and remain humble about the limits of our own knowledge. 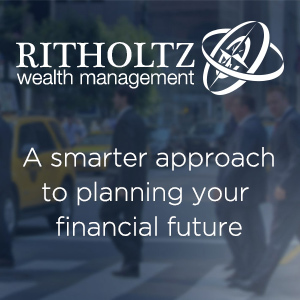 Is it possible to be a conscientious citizen of the world and grow your wealth? I wholeheartedly believe that being guided by your own unique sense of what is right is the only way you can grow your wealth and safeguard your happiness. Of course, neither wealth nor happiness is easy or guaranteed. Being a conscientious citizen and growing our wealth requires focus and work, although not the kind of work popular culture would have us believe. The news media and marketing machines bombard us with messages demanding our urgent attention and action – all the time. If we haven’t considered what we really want in this lifetime, we don’t know what trade-offs are important for us to make, so we follow random marching orders that lead us away from our goals and contradict our values. By focusing our efforts on planning, saving, and investing to reach our goals, we’re much more likely to achieve them. By working hard to clarify our values, we enable ourselves to make mindful investment decisions, instead of re-acting to all the media noise. If investing “responsibly” is important to you, then I suggest you consider the broadest possible global diversification. When you focus on diversifying your portfolio, the individual companies you own become less important, so “screening” out the companies, industries, or sectors you want to avoid is easier. The practice of owning a little bit of many good things reduces the impact of not owning bad actors that do well. What is the most important thing folks can do to achieve financial success? Own it! Your behavior is the single greatest determining factor of your success, so decide what is important to you and get to work. This is true of losing weight, getting a college degree, starting a business, or retiring a millionaire. Too many people say they want financial success, but they don’t want to plan and they don’t want to make trade-offs. They want to go out with their friends whenever they feel like it, and they want the instant gratification they are used to. They always want more, but they will never have enough unless they change their financial behavior. You can read more in Mindful Money: Simple Practices for Reaching Your Financial Goals and Increasing Your Happiness Dividend by Jonathan K. DeYoe with a Foreword by Alice Walker. 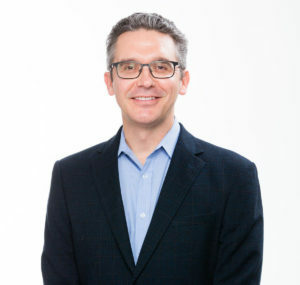 Jonathan K. DeYoe, CPWA, AIF, is a California-based financial adviser with twenty years’ experience and a longtime Buddhist. In 2001 he founded DeYoe Wealth Management, which works with families and institutions. He lives in Berkeley, California. More information at www.happinessdividend.com. *We did not receive compensation for the blurb or this post (outside of a copy of the e-book).